There are others who have become famous over the internet, and often not in a good way. The Star Wars kid, for example, was massively popular on YouTube; the infamous video has been viewed nearly 5 million times since it was originally posted in 2003. These, however, are not the people that make up the internet, but rather just flashes in the pan, things that everyone sees once. People like Maddox and Tom are universally known and omnipresent. But in terms of true omnipresence, look no further than Anonymous, a hacker group that rose to public prominence in 2007 after Fox News ran a TV spot on them. Their name comes from the websites on which they congregate, the *chan image boards, most famous of which being 4chan. 4chan on its own is not so bad, but the utter filth of the internet is concentrated on the "random" image board, also known as /b/. (Don't go there. Seriously. You can't un-see some things.) It was on /b/ that the Anonymous identity developed. They operate now on "/i/nvasion" boards to plot attacks on websites they believe have somehow wronged them. This is mainly done in the name of "lulz," a corruption of "lol," roughly translating to us normal people as "kicks." 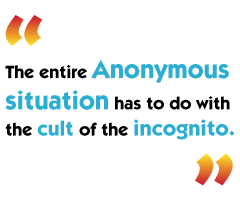 The entire Anonymous situation has to do with the cult of the incognito, the idea that if you give a man a mask, his true personality is unveiled. Anonymous can be said to represent the darker, feral side in all of us - they lash out with the slightest provocation, and they are many against few. Their own credo is they do not forgive, they do not forget and they are legion. It is the deepest insecurity within us that comes to the surface when we gain anonymity - all respect vanishes, and paranoia sets in. This is the reason for their utter lack of pity, their persistence, never stopping until it's time for the next /i/nvasion. Who says the next "Anonymous" won't be one of your friends, or worse, your enemies? Whenever we think about fame on the web, we have to remember all the flashes in the pan, all the videos we all saw once. Though there are those people who become very famous, most are just one-hit wonders without an identity or an agenda. It's an affirmation that we live in a culture where people can be famous just for being famous. But they can also be exceptional, whether for good or evil. Between the two extremes is everyone else, just a YouTube video away from all the fleeting glory in the world. Richard Thomas is a freelance contributor to The Escapist.